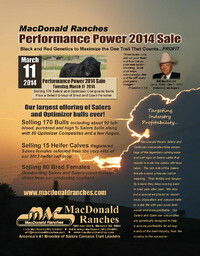 Click the picture to see our 2-page ad in the January issue of the American Salers. 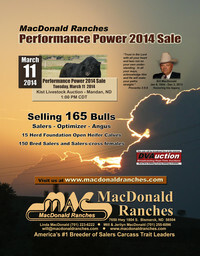 MacDonald Ranches Performance Power 2014 Sale is scheduled to be held on Tuesday, March 11 at Kist Livestock Auction in Mandan, ND. Selling will be about 165 bulls, including about 65 that are purebred and high percentage Salers and another 95 that are Optimizer composite bulls (Salers in combination with Angus or Red Angus genetics). The bull selection will be rounded out with about 6 Angus bulls. Also selling will be 15 open heifer calves selected from the top of our replacement pen and about 150 head of bred Salers and Optimizer females direct from our own cowherd that will sell in groups of 3 to 8 head. Sale catalogs will be mailed February 24 and the DVD video preview of the sale bulls will be mailed about the 1st of March. You can request a catalog and DVD by clicking here. Keep checking back on this page for additional information on sale bulls and data on the entire group as it becomes available. In addition to birth weights, weaning weights and EPD's, other data which will be available on the bulls includes a 100 day gain test, adjusted yearling weights, scrotal measurements and ultrasound measurements for carcass traits. Double-black bulls will be DNA tested for homozygous black genotype and select bulls will be tested for homozygous polled genotype. All bulls must also pass a BVD-PI test.